Last update: 13 November, 2018. Data shown below come mostly from booklets of CDs. New informations and/or suggestions are always welcome. Carl Schuricht "Weinger Eile, mehr Fülle"
Michel Chauvy "Carl Schuricht le reve accompli" (Revue Musicale de Suisse Romande, 2004). July 3 Carl Adolph Schuricht was born at Danzig (Gdansk) into a family of organ builders. His father, Carl Conrad Schuricht was born on 27 January, 1856. He was an organ builder and worked at his father's factory. He died on 9 June, 1880 (3 weeks before his son was born!) when he tried to help an employee fallen into the sea (in the bay of Danzig). 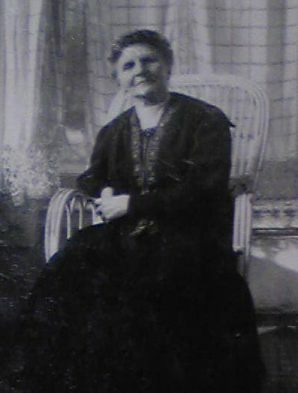 His mother, Amanda Ludowika Alwine Wusinowska was a well known Polish Oratorio singer (1847-1935). She didn't remarry after her husband's death. 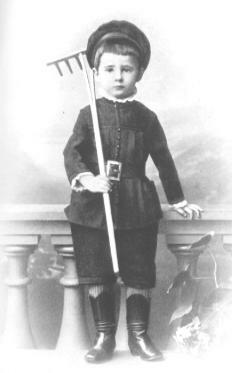 1886 Began to study piano and violin at the age of 6. Schuricht was a student at Friedrichs Realgymnasium in Berlin. 1891 Began to compose at the age of 11. 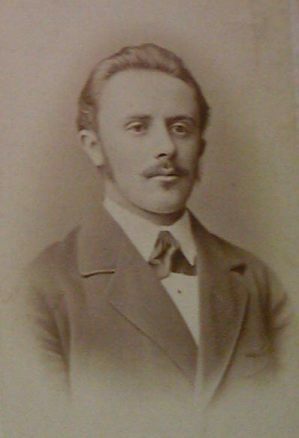 1892 Schuricht was a student at Königliches Realgymnasium in Wiesbaden. He had written the music and the librettos for two operas. 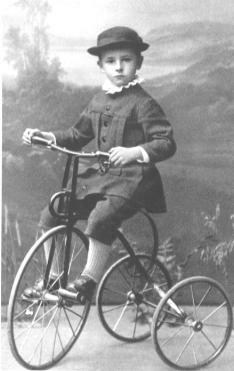 1895 Started to conduct at the age of 15. 1901/02 He got first professional musical job as a choral coach (Korrepetitor) of the Stadttheater of Mainz. (1902) Won a composition prize from Kuszynski Foundation and a scholarship was awarded him by Franz von Mendelssohn. It allowed him to continue his studies at the Berliner Musikhochschule (der Königlichten Hochschule für Musik in Berlin) under Ernst Rudorff for piano and van Eyken (not Humperdink) for composition, and later under Max Reger at Leipzig. His musical compositions were published mostly from Drei-Lilien-Verlag, Berlin. 1907/08 Became Operetten-Kapellmeister of the Zwickau Stadttheater. 1908/09 Became the conductor in Goslar of both a mixed chorus and a male chorus which assists the "mixed". 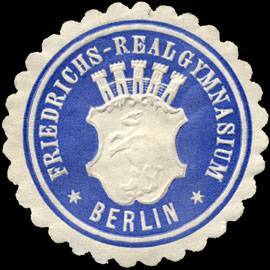 1909 Appointed to conduct the Rühlschen Oratorienchores (Rühlscher-Gesangverein) of Frankfurt am Main, succeeding Siegfried Ochs. He introduced the works of Frederick Delius in Germany. 1912 At the age of 31, he was appointed to be the music director of Wiesbaden and conducted the Städtische Symphonieorchestra and the chor (an article in Neue Zeitschrift für Musik). (Exactly 3 years after the world premiere in Munich). Debut at La Scala in May. 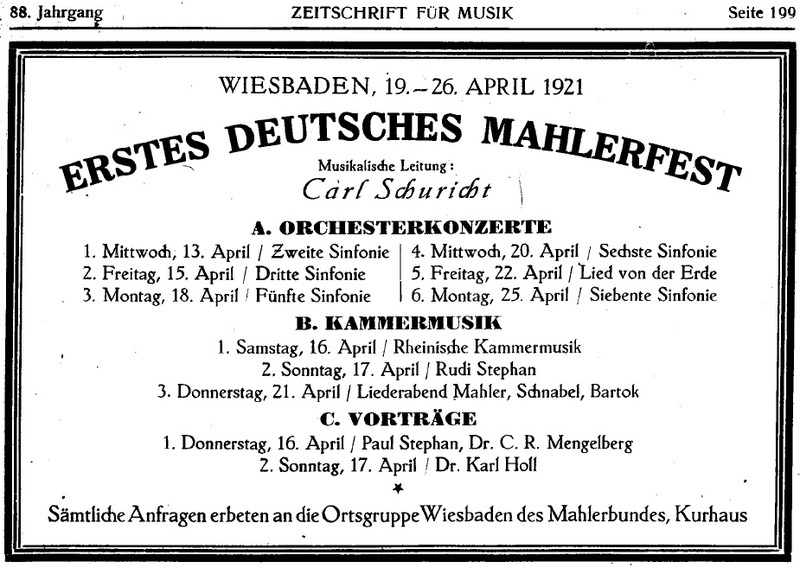 13-25 April During his "First German Mahler Festival" in Wiesbaden, he conducted the "Das Lied von der Erde", the 2nd, 3rd, 5th, 6th, and 7th Symphonies (Advertisement on Neue Zeitschrift für Musik, poster of this festival). 2 May Schuricht conducted BPO for the first time (Mahler:Sym.6). 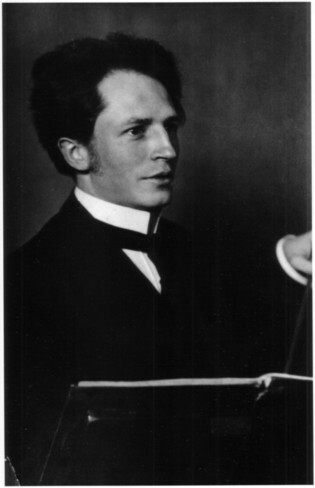 13 May Furtwängler visited Wiesbaden and conducted Beethoven: Fidelio (Mechler, Andra, Streib, Kipnis, Muller-Leichel). Activity of Furtwängler at Wiesbaden is listed here. 6-9 June Schuricht directed at the 4th Brahms Festival in Wiesbaden together with Wilhelm Furtwängler. 5 June (Schuricht): Brahms: Symphonie no 3, Ein deutsches Requiem. 6 June (Schuricht): Brahms: Symphonie no 3, Ein deutsches Requiem. 7 June (Furtwängler): Brahms: Variationen uber ein Thema von Haydn, Double Concerto (Adolf Busch, Paul Grummer), Symphonie no 1. 9 June (Furtwängler): Brahms : Alt-Rapsodie (Sigrid Onegin), Concerto pour piano no 2 (Edwin Fischer), Symphonie no 4. 1923 He became the general music director of Wiesbaden (until 1944). 1928-33 Schuricht had been staying at the Hotel Oranien in Wiesbaden (Original website). 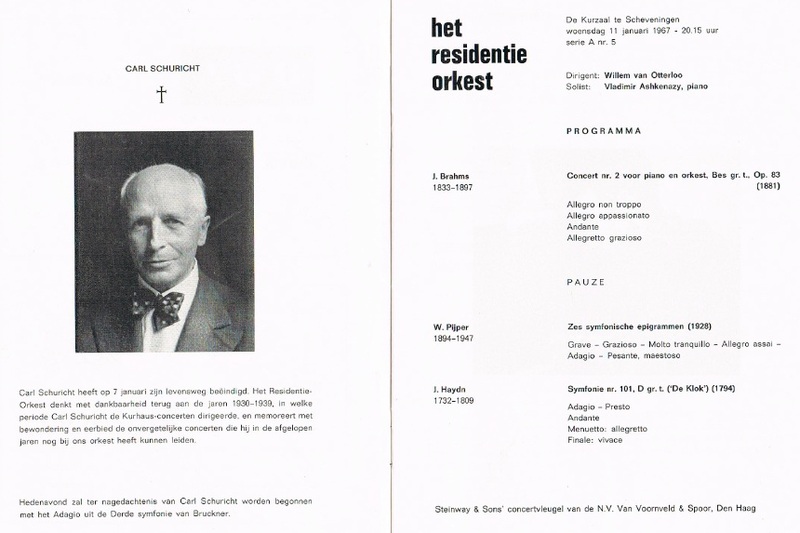 1930-39 Conducted the summer symphonic concerts in Scheveningen. 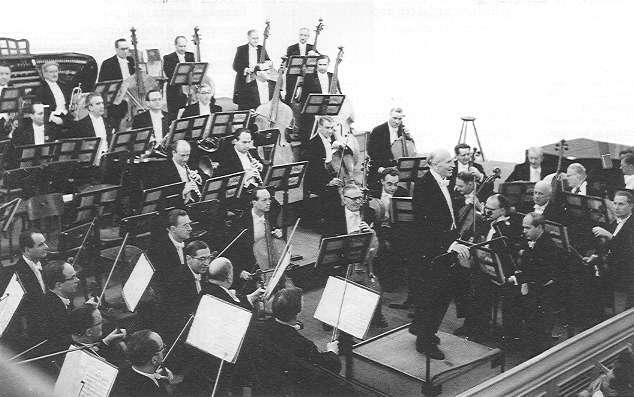 1931-33 Conducted Leipziger Rundfunkorchester (source). 1933 He was nominated the director of the Berlin Philharmonic Choir. 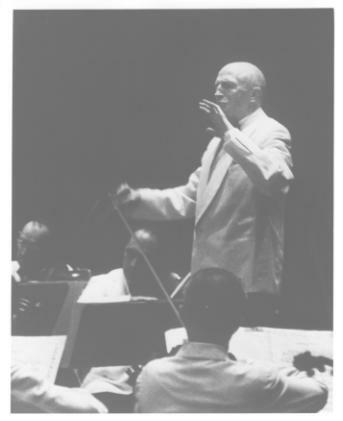 1934 He conducted VPO for the first time. 1935 His mother died at the age of 88. 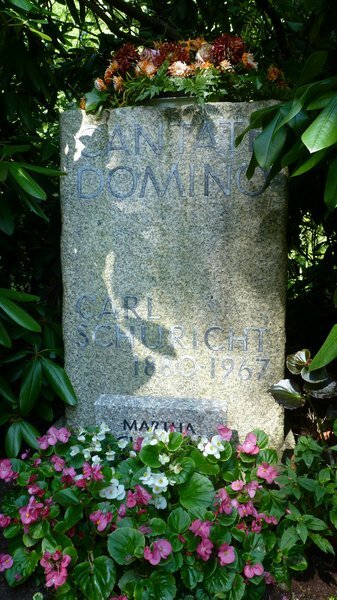 1937-44 He was a principal guest conductor of the Frankfurt Radio Symphony Orchestra. 1938 Queen Wilhelmina of Holland endowed him with the Order of Oranje-Nassau. 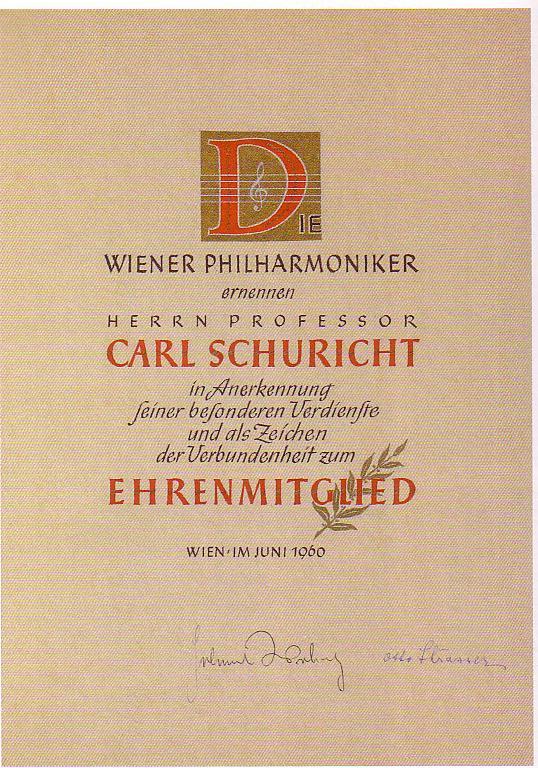 1943-44 He was a principal guest conductor of the Dresden Philharmonic Orchestra. 1944 His name was listed in the Gottbegnadeten list (Wikipedia English, Deutsch). In spring, he married with Maria Martha Banz in Zurich. July He was appointed to be the music director of the Dresden Philharmonic Orchestra. November He left Germany for Lucerne Music Festival and stayed in Crans-Montana, Switzerland. Started to work with l'Orchestre de la Suisse Romande. 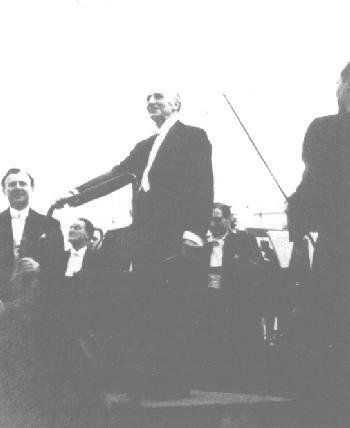 1946 At the re-opening of the Salzburger Festspiele, he conducted VPO. 1948 Got Bruckner medal in the Netherlands. 1949 His last concert at La Scala on May 21. 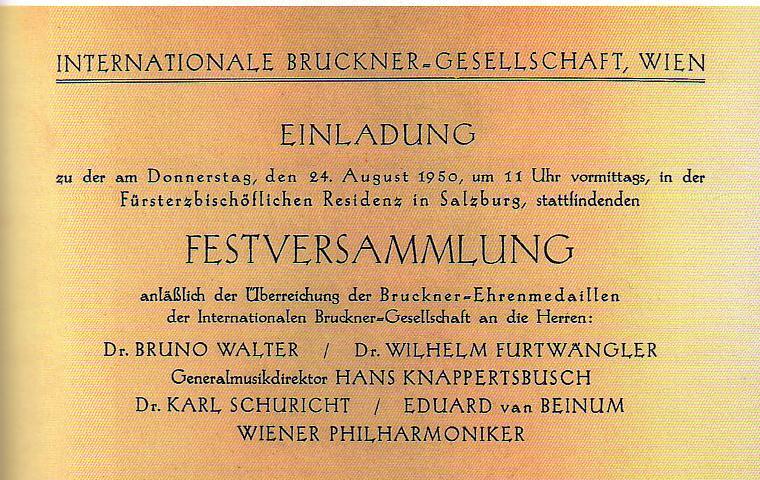 1950 On 24 August, he got the international Bruckner medal at Salzburg (announcement). 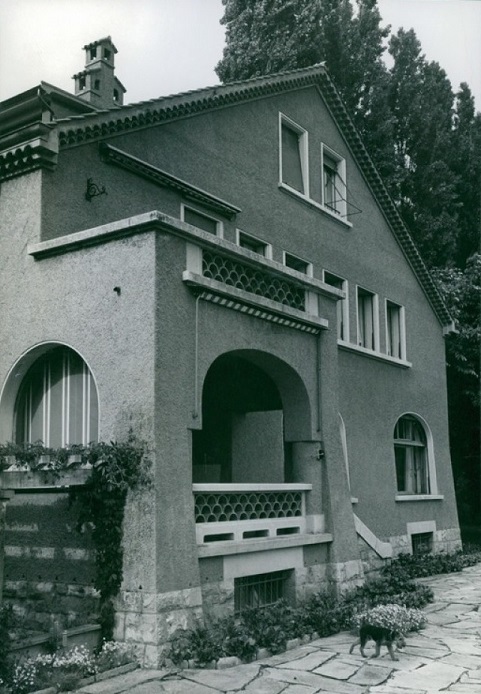 1952 Moved to a new apartment "La Provençale" at Corseaux, route des Cerisiers 21. 1953 Became an honorary citizen of Wiesbaden. 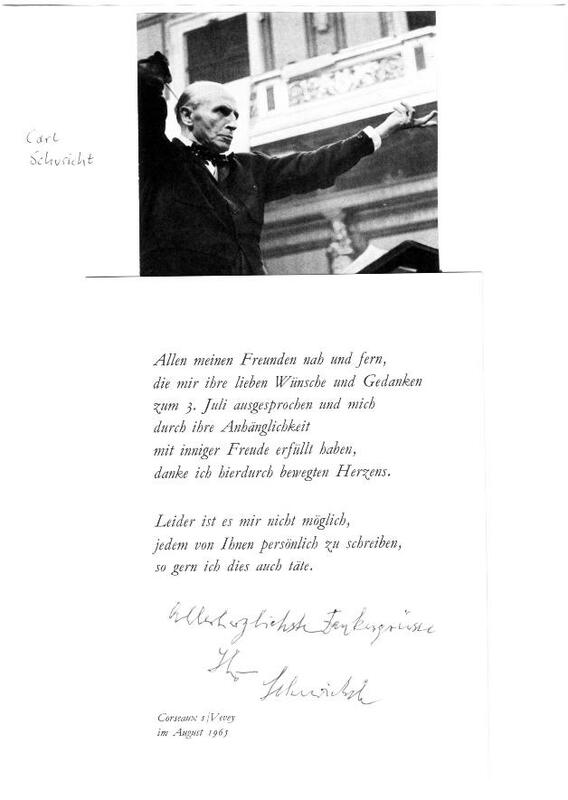 1956 On 15 Jan., Schuricht conducted VPO for Furtwängler-Gedächtnis-Konzert at the Grossen Musikvereinssaal. On 26 Jan., during the Salzburg Mozart Week, Schuricht conducted VPO and impressed the audience greatly. The program was as follows. 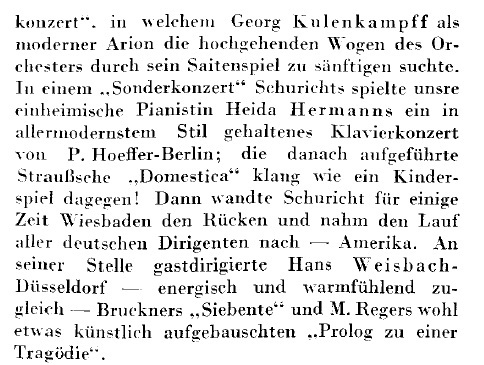 On the next day, Erich Kleiber, who was willing to take on the first US tour of VPO, died in Zurich. Committee of VPO decided to ask this 76 year-old conductor to join this particularly important tour with Andre Cluytens. He conducted all of Beethoven's symphonies at the Lyon Festival in June (Newspaper 1, Newspaper 2). Schuricht conducted 12 concerts in total during the US tour (complete list of concerts, Booklet ). 10 Dec. Made a concert for the Human Rights Day at the general assembly of the United Nations, New York. Program of this concert was as follows. VPO awarded him their Nicolai Medal. 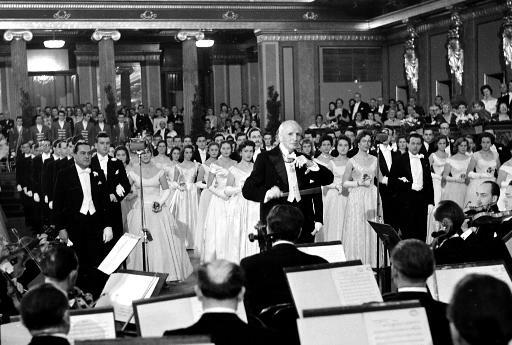 1957 January He opened the 17th Vienna Philharmonic Ball with the Blue Danube waltz. He was invited to conduct at the Chicago Symphony Festival at Ravinia. He also appeared as a guest conductor at the Berkshire Music Festival at Tanglewood, Massachusetts, the summer residence of the Boston Symphony Orchestra. Tanglewood, 1957. With the Boston Symphony Orchestra. 19 Sep. 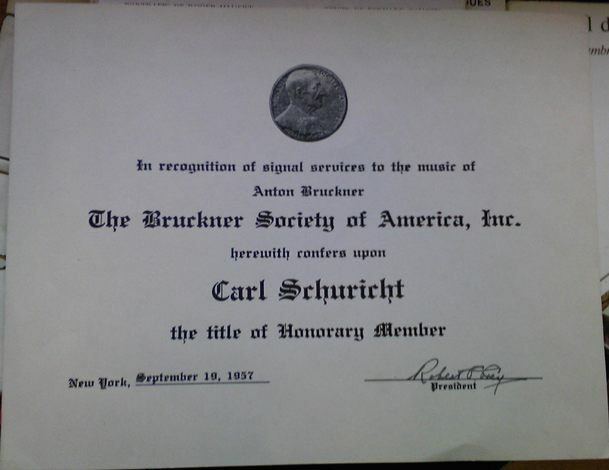 The Bruckner Society of America confers upon Carl Schuricht the title of Honorary Member. 14,15 Jan. Conducted VPO at "Furtwängler Gedächtnis Konzert". 18 May Awarded one of the first Gold Mahler-Medals from the Gustav-Mahler Society. After the success of US tour, VPO and Schuricht made another travel project. In November, he conducted a total of 10 concerts for VPO in Switzerland, France, Spain and Bregenz. See the schedule of this tour. Aug. 14 Conducted VPO at Salzburger festspiele. A criticism for this concert appeared on Kurier. 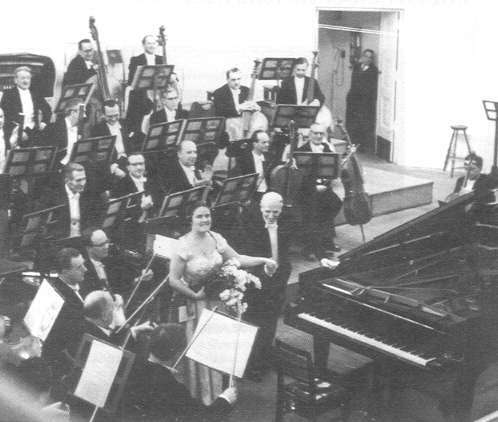 1961 March 18/19 Conducted VPO at the Nicolai Concert. Aug. 23 Conducted VPO at Salzburger Festspiele. Live recording is available from DeAGOSTINI(FS96CD31-2). 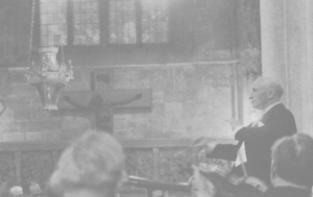 1962 During the Vienna Festival Weeks, he conducted VPO for Mozart's Requiem at St. Stephansdom. 1963 April 9 Conducted London Symphony Orchestra at the Royal Festival Hall. (Weber Overture Oberon, Mozart Symphony No. 40, and Brahms Symphony No. 4). 1964 Jan. 27 Appeared in London and conducted LSO for Mozart's Haffner symphony and Beethoven's 9th Symphony. 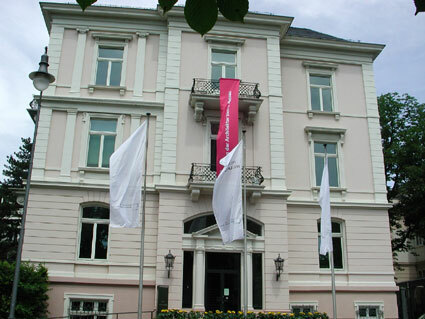 Aug. 5 Conducted BPO at Salzburger Festspiele. Aug. 11 Schuricht was endowed "Gran Cruz Orden Civil de Alfonso X El Sabio" from Spain. 1965 On March 21, he conducted London Symphony Orchestra at the Royal Festival Hall. (Schubert Symphony No. 8, Mahler Kindertotenlieder with Nan Merriman (MS), and Brahms Symphony No. 2). Two days after, again at the Royal Festival Hall, he conducted LSO (Schubert Symphony No. 8, Mozart Clarinet Concerto K622 in A with Gervase de Peyer (Cl. ), and Brahms Symphony No. 2). Aug. His Letter to friends on his 85th birthday. Aug. 6 Last concert with VPO at Salzburger Festspiele. 1967 Jan.7 He died at the age of 86 at his home in Corseaux-sur-Vevey, Switzerland. Jan. 10 Funeral ceremony at the temple of Saint-Martin in Vevey from 15:00. 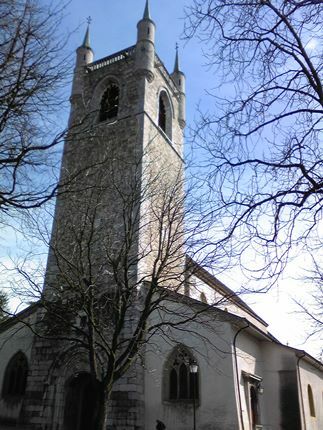 Saint Martin temple in Vevey. Jan. 11 Memorial concert for Carl Schuricht was held by Residentie Orkest at the Kurzaal in Scheveningen under the direction of Willem van Otterloo (Program). Feb. 28 Memorial concert for Carl Schuricht was held at the Großen Kurhaussaal in Wiesbaden. Heinz Wallberg conducted W.A. Mozart's Concerto for Oboe in C major and A. Bruckner's 9th symphony. 2011 May 21 Mrs. Martha Schuricht passed away at the age of 95.